SABR Digital Library launches with "Can He Play? A Look at Baseball Scouts and Their Profession"
We're pleased to launch the new SABR Digital Library with the publication of CAN HE PLAY? A Look At Baseball Scouts And Their Profession. They dig through tons of coal to find a single diamond. They spend countless hours traveling miles and miles on lonely back roads and way too much time in hotels. Their front offices expect them to constantly provide player reports and updates. So much of their time is spent away from family and friends, missing birthdays, anniversaries, and holidays. Their best friend is Rand McNally. Always asking the question, “CAN HE PLAY?” Such is the life of a professional scout. CAN HE PLAY? collects the contributions of 26 members of the Society for American Baseball Research on the subject of scouts, including biographies and historical essays. The book touches on more than a century of scouts and scouting with a focus on the men (and the occasional woman) who have taken on the task of scouring the world for the best ballplayers available. In CAN HE PLAY? we meet the “King of Weeds,” a Ph.D. we call “Baseball’s Renaissance Man,” a husband-and-wife team, pioneering Latin scouts, and a Japanese-American interned during World War II who became a successful scout—and many, many more. For those interested in learning more about scouts and scouting, and helping contribute to our understanding and appreciation of the profession, please consider joining SABR and the Scouts Committee. Or click here to read all published SABR BioProject biographies of baseball scouts. E-book: Click here to download your FREE copy of Can He Play? A Look At Baseball Scouts And Their Profession from the SABR Store. Available in PDF, Kindle/MOBI and EPUB formats. Paperback: Get a 50% discount on the paperback edition of Can He Play? A Look at Baseball Scouts And Their Profession from the SABR Store ($15.99 includes shipping/tax). E-book: Click here to purchase e-book version of Can He Play? 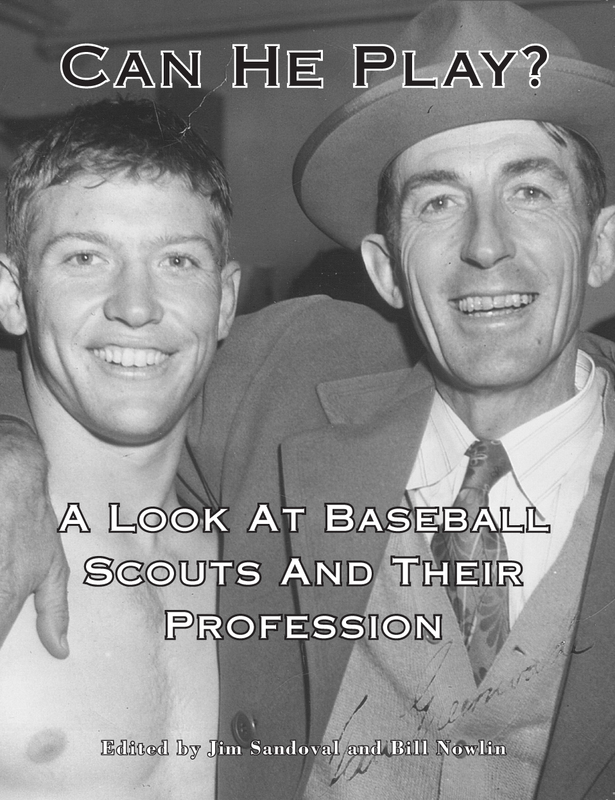 A Look At Baseball Scouts And Their Profession e-book for $6.99 from the SABR Store. Available in PDF, Kindle/MOBI and EPUB formats. Paperback: Click here to purchase the paperback edition of Can He Play? A Look at Baseball Scouts And Their Profession from the SABR Store ($30.99 includes shipping/tax). For 40 years, SABR and its members have led the way in publishing the best baseball historical and statistical research. Our publications program is shifting to take advantage of new methods of publishing. Not only will we continue to publish new books like CAN HE PLAY?, which showcase the best efforts of SABR's members, chapters and committees, but now new technology makes it possible for us to bring out-of-print titles back again. Books will be available in digital formats as well as paperbacks produced by "print on demand" (POD). Stay tuned throughout the year for new (and old!) titles that we'll be adding to the SABR Digital Library. SABR members will get discounted rates for all e-book publications. If you're not a member, click here to join SABR. To learn more about SABR Publications, contact Cecilia Tan at ctan@sabr.org. To view all the books in the SABR Digital Library, visit SABR.org/ebooks.